Is Live Inbox an alternative to Xobni? I was thrilled this morning when I discovered live inbox. It’s brand new – launched this month (June 2011) and claims to be an alternative to “evil xobni” (live inbox with each word spelled backwards). I had just started trying out Xobni but – as the live inbox people rightly point out – it came with lots of problems, including nearly no customization options and initial problems with drag-and-drop in Outlook. So I was searching the web for an alternative and I thought I had found it in live inbox. – Installation: the automatic download of Microsoft Virtual Studio runtime x86 failed (tried several times) so I located it manually on the web, downloaded and installed it. – After that, Live Inbox still wouldn’t install, even though my win7 user account has admin privileges (error message complaining that I did not have permission to write in some directory). Only when I started the setup by right-clicking and selecting “run as administrator” did the installation go all the way through. 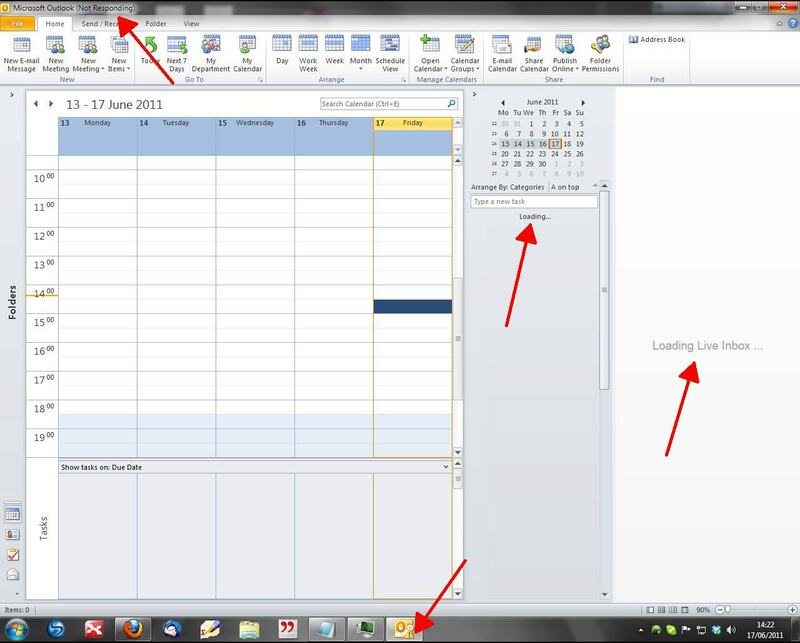 – But the annoyances were not over at that point: starting outlook took ages even before the live-inbox pane even appeared on the screen and when it did it said “live inbox loading” for I-don’t-know-how-many minutes. Obviously, the add-on was indexing my inbox with several thousand emails. But it was not telling me so and it was not letting me use outlook while it was doing it. In contrast to Xobni, which was almost exaggerating its efforts to keep me entertained during the process. – Once it had loaded in my Outlook calendar (which is my default view when starting outlook) I found no way to get it to show in a second outlook window which I opened with my emails (right click the mail-icon in the navigation bar). So I am forced to use the *first* outlook window to read my mail. – I also found no way to close the Live Inbox pane completely. Xobni, in contrast, placed a useful button in the Home-ribbon for that. Even a system restart did get Live Inbox going. – Meanwhile, Outlook was using 45% of my CPU and constantly complaining that it was “trying to retrieve data from the Microsoft Exchange server…” which did not seem to work (see screenshot below). – I tried rebooting windows, as a last chance but nothing changed (see screenshot below). So off you go: “uninstall live box” was the end of that adventure. Unfortunately. I would have liked to see if these guys can keep the promises the are making on the webpage, but well – I’ll probably come back in half a year or so, hoping that you still exist. But at this point, I can only recommend to anyone: don’t even try to install live inbox. It’s really not worth it. Yet (I hope). P.S. I should also like to mention that I do not recommend using Outlook as an email client in the first place. I am only using it because my employer (or Microsoft – I don’t know whose fault it is that our Exchange server just won’t cooperate with Thunderbird through IMAP) is basically forcing me to use it. So I’m trying to make the best of it (and would be grateful for any hints or comments of how to make life with outlook more userfriendly, transparent, and customizable). The above review is based on Version 1.1.7 (compliled 6 June 2011) of Live Inbox on a Win7 Pro machine (32-bit) with Office 2010. Please do leave a comment below if you have experience with a newer version that works! In case you’re wondering: After having agreed to serve as a beta-tester (see Sumanth’s comment below) I did not hear anything for three months but then I received an updated version of live inbox in which all the above mentioned problems were supposed to be cleared out. However, I had huge problems getting the program running. First, it took 27 minutes to index my inbox and then it kept crashing due to some license issues. Sumanth told me that this was only due to the fact that I had previously installed a version of live inbox and that the issue will be resolved in the next release. So in brief: I am not giving up hope for this to become a true alternative to xobni, but at the moment it still looks like a long way to go. 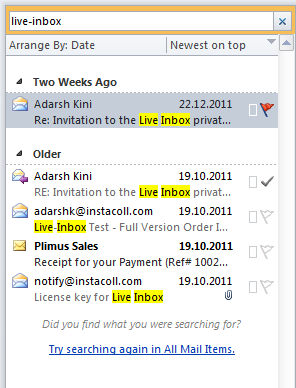 Update 2 (10 Dec 2011): I thought I should mention that I have received a new version of Live Inbox already in October but I have been so busy those last months that I did not have time to install and test it. I am looking forward to do this sometime soon, hopefully and I’ll let you now the results in a new post. Thanks for your patience. Update 3 (6 Jan 2012): Just before christmas I finally took the time to check out the latest version (compiled 22 Nov 2011). And I was once again harshly disappointed. It was just a waste of time. Any normal user would have been left with a non-functional outlook after trying to install that version. First outlook crashed completely while live inbox was supposedly trying to scan my inbox. And when I say “completely” I mean that I had to kill the oulook.exe process on the Windows Task Manager; nothing else worked. After a forced restart, I was asked for a license but clicking on “retrieve license” (as I was told to do in an email from the developers) just led to the license being sent to my inbox again and again (where it had been lying all the time anyway). The software refused to do anything except for telling me that I need a license. As you can see in the screenshot below, there was not even a possibility for me to somehow enter the license manually and it was not possible to activate any part of the plugin without getting this error message. 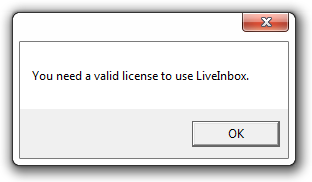 The only way to get around this was by saving the license file from the email to my desktop, reinstalling liveinbox and directing it to that file as soon as it asked for the license (rather than clicking on “retrive license”). 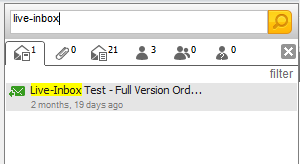 For a moment it then seemed to work but when I restarted Outlook, the whole Live-Inbox plugin had disappeared again. LiveInbox really does not care about it [the networking pane]. We do not modify The Addins section in the registry… NO we just don’t play around with other plugins. There is no code in LiveInbox that does that. What social networking pane was this ? It’s funny that they don’t even know about this! It’s part of Outlook and the official name is “Microsoft Outlook Connector for social networks” (socialconnector.dll). During the installation I was told that the .NET Framework version 4 needs to be installed and a browser window was opened with the download page. So I downloaded and installed it but even after that, the Live-Inbox installation was still stuck at the same point and did not pick up the changes I had made. I had to click “Cancel” and restart the installation. This is not how an installation procedure should run. It should at least tell you to restart the process after installing .NET rather than pretending to be still up and running. After installation, I agreed to “start Live inbox for outlook 2.0” but what was launched was the setup procedure for Outlook, not Outlook with my existing account. Hello? When I started Outlook the normal way, it suddenly opens two instances of Outlook. Dont ask me why. After indexing my Inbox, I am again asked for the license key (although there are still several copies in my inbox). Again, I had to save the license file on my desktop and direct live-inbox to it. Now it is up and running. However, it is not working. I don’t know what these guys are doing, but I thought the point of live inbox was to make it really easy to quickly find any email. So as I was writing this update, I searched for the emails I had exchanged with the live-inbox team. I searched for “live-inbox” which is contained in all of their email adresses but only a single email was found (see screenshot). I did get all live-inbox email adresses that I corresponded with, but not the emails themselves. So without even extending the search to other folders of my inbox, Outlook already found more mails than Live-Inbox. — Hello? I really don’t understand what’s going on here. As I said earlier: It’s a real pity that the live-inbox people are not getting this to work at all. The only thing that changes is the version number: The current version is already called “Live-Inbox for Outlook 2.0” Ha ha. Unfortunately, I cannot tell you the exact version number of the build that I have been testing in this update because the “About” button in the Live-Inbox ribbon is not working. But, as mentioned above, its the build of 22 Nov 2011.